It may be clich�, the fact that she has been made so many times and also the fact that most of the people still find her the most beautiful woman on planet. Well I am a clich� person, so yes�I have made her, and yes�I think that she�s one of the most beautiful women on earth. Angelina is known as one of the most recognizable actresses on planet, known for being married to Brad Pitt, also known as the owner of the most wanted lips and as a Goodwill Ambassador. 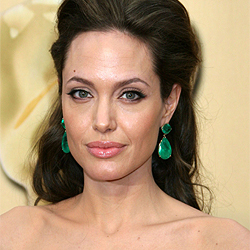 Angelina received awards like: Golden Globes, Screen Actors Guild Awards and an Academy Award. Her most famous movies are �Tomb Raider�, �Gia� and �Mr. and Mrs. Smith�. 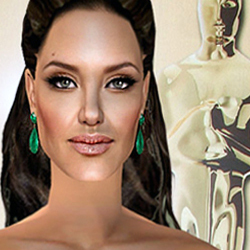 I must say that I�ve spent hours creating this sim, and making her look like the real person, and also creating all required parts, so that she can look like she did on Annual Academy Awards. The dress requires �The Sims 2 Nightlife�. Earrings require mesh from Liana Sims. Hair requires Myo�s mesh from Sim Artist Union. - Dress - Creations By Stefan / NO REDISTRIBUTION! - Hair Recolor - Creations By Stefan / NO REDISTRIBUTION! - Skintone - Creations By Stefan / NO REDISTRIBUTION! - Eye Color - Creations By Stefan / NO REDISTRIBUTION! - Hair Line - Creations By Stefan / NO REDISTRIBUTION! - Earrings - Creations By Stefan / NO REDISTRIBUTION!